pishtech.com • View topic - A Beautiful Jumping Common Carp For You! A Beautiful Jumping Common Carp For You! I just finished building a Jumping Common Carp and want to share it with you. In the old days when fish barely broke the surface in RWFF outings it didn't matter what they looked like. However, with out new Jumping Settings these fish are visible to the angler so it is very important to get them to look good when they do their jumping and fighting. I found a great profile picture for a Common Carp and I decided to build a new one. Here are the images of the new fish. I thought it looked pretty cool. I am working on a very exciting outing called "A Day Fishing With the Big Boys". I hope to include this beautiful carp in the new outing. I hope you will be able to see it do is Acrobatics soon! Re: A Beautiful Jumping Common Carp For You! Stanley, I think it looks terrific. BUT...BUT...here's the thing. The picture you used there is of a juvenile/young carp. See the size of the eye compared to the scales? That one would barely get over 10"-12". Doesn't yet have that powerhouse look to it. Carp scales grow and become wider the bigger they get. If you'd like, I can look around for a better representation of your Jumping Common Carp for you. But also keep in mind, Common Carp do not jump very often. WHen fighting, carp are more of a bulldog fish, if you will. Readily making long, strong runs. They will surface and occasionally jump from time to time, but most often they surface and submarine right back down. I would suggest its jump rate to be low. But, in the grand scheme of things it's entirely up to you, my friend. Aren't you glad I'm back? This one here for example was roughly 15"-17". See how it already possesses that "powerhouse" look to it, by the size of its head relative to its scales? 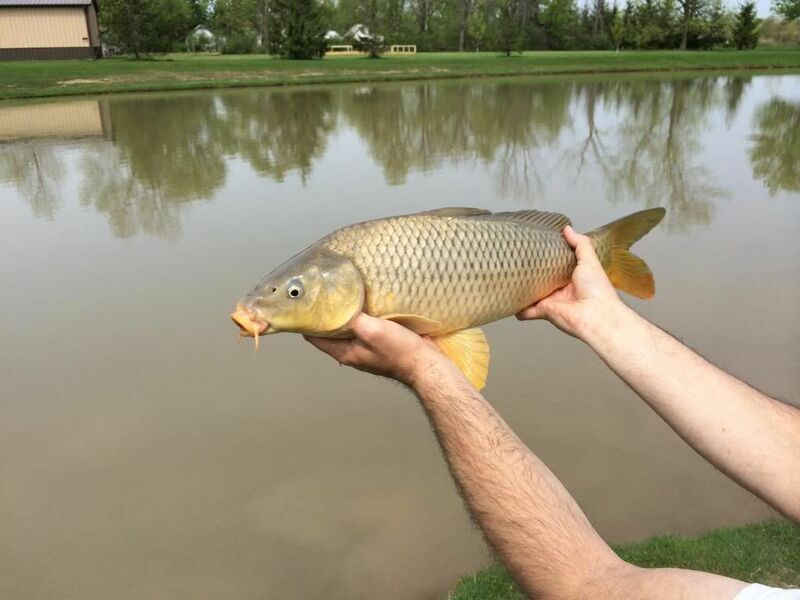 Chuck, Wow, that is a beautiful picture of a Carp, love it! Wished you could have put in on a plain surface (like a cardboard) and have it lie down and hold still for a second or two while you take the picture. You will have to learn to say "sit and stay" to the Carp. Maybe "lie down and keep still" ? I build this Jumping Carp because it had a "perfect" profile picture for a fish builder. Perfect side view without distortion, all the fins were in place and clearly seen, and the picture was in high resolution. The fish had beautiful colors and a nice patina to it. 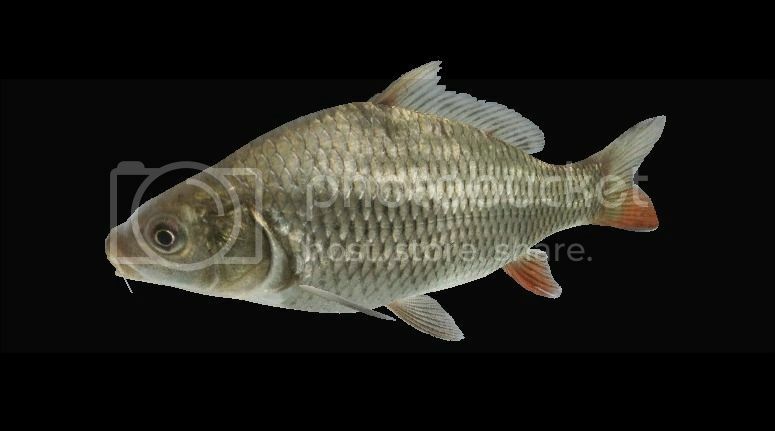 Yes, it is a picture of a juvenile Carp. This might come in handy when I build another outing for the "kids" again! Also you were only partially right about Carps not Jumping. In fact they do jump a lot....even though sometime not when they are fighting a fisherman. In Ancient Chinese Mythology there is a story about "The Carp jumping over the Heavenly Doors". The Carp was perceived as an object of good fortune to the Chinese and was a very important part of Ancient Chinese culture. It presents a symbol of good fortune and happiness. There are many explanations about why Carps jump, some folk lore and some scientific and you can look those up in Wikipedia to get the full picture. It is an education in itself! By the way, It is good luck to see a Carp jump out of the water. So the next time you go fishing keep a look out for that. The bigger fish the bigger luck and everybody can use some of that! 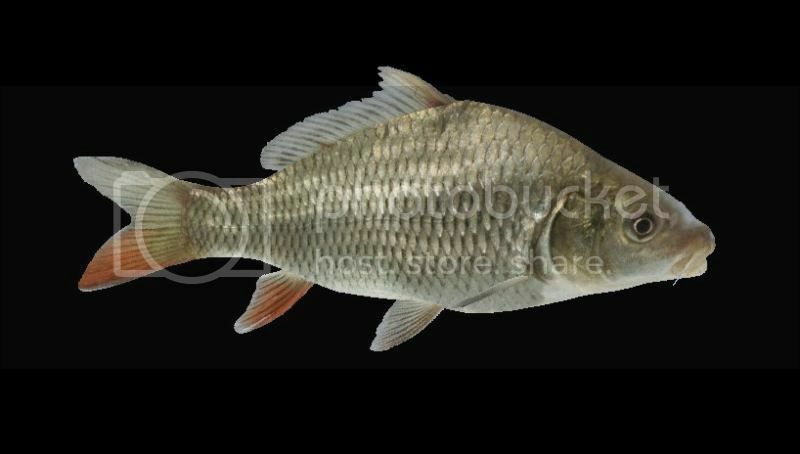 Jyndrek, thanks for the links to the various Carp fishes... the scaleless carp looks very interesting and appears to be a form of the Mirror Carp missing some DNA's. I will try to find a good profile picture of one and built it for you as you said this fish is quite common in Poland. Ah, yes you are correct Stanley, about the jumping part. I was writing from a purely angling perspective where hooked carp do not jump often (unlike bass for example) and are more of a bulldog/line-peeling fight. Yes I have seen numerous carp breach and jump while feeding. I hope you will catch some nice Carp the next time out and you will teach it to "lie down and stay still" so you can get some good profile pictures. I always thought it was cool to use our member's personal caught pictures in our fish files. Don't forget to get a picture of yourself holding the fish so we can use it in our caught fish folders. Good luck and land a big one for me! Super! I'll share this post with my friends.